The Fund's investment strategy and structure are set by the Strathclyde Pension Fund Committee. Our Investment Advisory Panel develops recommendations for the Committee to make the formal decisions. The Panel also carries out much of our investment monitoring on the Committee's behalf. Quarterly Committee papers are available from the About Us > Governance > Strathclyde Pension Fund Cttee area of our website. Our Statement of Investment Principles (SIP) outlines the Fund's current investment strategy, its investment principles and objectives, as well further details of the investment decision-making process. 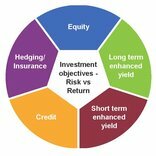 The Fund's strategy has moved towards a risk-based framework. More details can be found in the Committee papers on investment strategy changes.